Handling kids can be a great exercise, but it can also become much of a frustration. When you have to go outdoors with your kids, you also need to have a good stroller like Schwinn Turismo Swivel Single Jogger. IMPORTANT! This baby carriage also used to be avalabte as a twin model. Unfortubnatelly it is not being sold anymore. However, if you are not willing to put out much money for a single jogger, you might end up compromising comfort for the price. 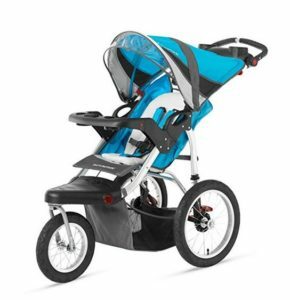 If you are looking for a jogger so you can take your child with you on your morning walks and errands, this pram is an excellent choice for you. It doesn’t cost as much as other joggers, yet it performs well. You can now take your toddler with you if you have to go to the mall or take a walk in the park. When you are going to go shopping for groceries and more, this pushchair will be a great help to you in keeping your child safe and comfortable. There is a storage bag under the pram that might come handy if you are picking out supplies. You can also use this to keep your baby’s things. In terms of comfort, the seat is padded, and there is a canopy with visor and weather shield to keep your kid protected and comfortable even when an unexpected rain shower comes. If you feel like the seat is a little farther on the back, there is an additional accessory – extra padding – that you can buy to make it more comfortable. This great pram just doesn’t run out of things to keep you organized. There is a parent tray and a child tray so you can bring your food and drinks as well that if your kid. There are also a lot of pockets to place your snacks and other things. The five-point harness will keep your child secured in his seat while you stroll around the city streets. It is also worth to mention the excellent customer service this manufacturer provides in case of any problems. This Schwinn pram is unbelievably easy to handle and maneuver around curves and rough terrain. If you are jogging on a path with sand and pebbles, you can have this stroller in tow and encounter no problems at all. The front wheels are 12” swiveling wheels, and the back is a good 16”, so you can quickly turn it without hitches. The Schwinn Turismo Swivel jogging carriage is an actual example of ‘what it says on the tin.’ Its title of ‘free’ comes with effortless maneuverability and ease of use when handling this pram. Customers have praised this stroller’s adjustable handlebar height, pointing out how just how easy it is to utilize the jogger compared to others of its kind. It is not only smooth to operate, but it also works on all solid surfaces, and babies have been reported to find the ride enjoyable as well. Due to having three pockets, storage is not an issue when going out with the pram, and the back support reclines almost all the way, greatly benefiting the baby. However, this stroller has been known to gain complaints due to its vast size and bulk, something that disables newer users from effectively using the baby carriage to its fullest extent.